Free, of course, means handset manufacturers will build the cost of the MusicStation Max plan into their devices, sell them to the carriers, who will resell them to consumers along with a special music, voice, and data plan. We can assume that “special” means more expensive as music is added to voice and data. There’s no confirmation yet on carrier partners, although the service does build on the existing MusicStation subscription model, which has more than 30 carriers signed up worldwide (but not in the U.S.). Cost of the plan runs £1.99 to £2.99 per week in the U.K.
With MusicStation Max, consumers can download music directly to their cell phones for 12 to 18 months, depending on the plan chosen, after which they will have to purchase another Max phone (and plan) to keep downloading. If they choose not to re-up, they still own their downloads and can use them on the device originally purchased or on a computer but not on other devices such as an iPod or Zune. LG Electronics introduced today at Mobile World Congress in Barcelona a touchscreen handset for MusicStation Max; it will launch in the first half of 2008. Many mobile devices already on the market support MusicStation, but LG’s branded phone will make the service more prominent and easier to use. 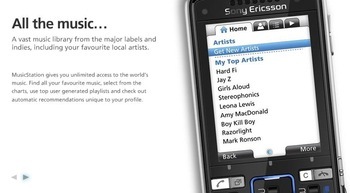 The MusicStation service was introduced at last year’s mobile conference, then known as 3GSM, and it’s been commercially available since June. It reached the U.K. market in November. last100 asked at the time of MusicStation’s debut in the U.K. how people liked their music. Do they want to own it? Rent it? Or get it illegally off the Web. The questions are still valid. Will people go for the MusicStation Max because they don’t have to pay (in the traditional sense) for unlimited music from the four major labels? Will they be willing to pay for higher-priced, Max-enabled phones? Will they be comfortable with the idea that they must purchase a new Max phone 12 to 18 months after they bought their first Max device? Are they comfortable using a mobile phone as their primary portable music player? Will they care that they can transfer their purchases to a desktop computer but not be able to burn discs or move the tunes to different media? Rob Lewis, CEO of Omnifone, thinks the carriers will like MusicStation Max but doesn’t say anything about consumers. “We’re expecting a lot of clamor and competition from operators for the MusicStation Max,” he told Total Telecom. 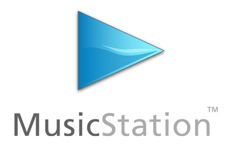 MusicStation and the new MusicStation Max are certainly worth watching on all fronts — the carriers, the handset manufacturers, the consumers, and the music industry as a whole. It’s a start toward a new business model for the troubled music industry.